A Letter to the Editor published at the end of November in The New England Journal of Medicine excited a lot of comment and mass media coverage. The letter by Holt and colleagues, “An Unconscious Patient with a DNR Tattoo,” made the news throughout the U.S., and internationally. This was treated as an unusual oddity, but DNR tattoos are a lot more common than one might think. Try searching for images of them. The first I heard of them was a news report in the late ’80s of an ICU nurse who had one done, to guard against a fate that had befallen too many of her patients. Image description: a screen shot of Google image search results for “DNR OR “do not resuscitate” “tattoo”” captured January 9, 2018. Acting on the advice of their ethics consultants, the University of Miami physicians decided to honor the tattoo and wrote a DNR order for the patient, but in the article they studiously avoided taking any position for or against DNR tattoos. I think they were right to honor the tattoo, but maybe more timid than they needed to be on the general question. I’ll put up three cheers for DNR tattoos. First, once I’ve got that tattoo, my advance directive goes wherever I go, always there when I need it. Unlike written directives, which are virtually never found in the ER, too seldom presented on admission, and often devilishly hard to get into the medical record for those patients who purportedly have one. Second, unlike state-authorized advance directives, the DNR tattoo does not require anyone to witness my signature as evidence that the wishes expressed therein were indeed mine. Unless you imagine I was somehow unconscious or blind drunk when I got my tattoo, the wishes expressed thereupon are undoubtedly mine. And getting a witness for a state-authorized advance directive can be more difficult than it sounds, with all the people prohibited from serving under many statutes. Still, for the legally scrupulous among you with high pain tolerance, it may still be possible to have your DNR tattoo witnessed. As I’ve just pointed out, these are not uncertainties unique to tattooed advance directives. Just as importantly, these are uncertainties that can be resolved by two factors that can tip the balance in favor of honoring the tattoo. First is knowledge of the circumstances in which the patient got the tattoo. Was it sometime during the course of a progressive, worsening illness? Then it is entirely reasonable to infer that the patient did not want to be resuscitated from the cardiac arrest waiting at the end of that decline. Second (and related) is prognosis. Given the severity of the patient’s condition, what are the chances of a successful resuscitation that at least might return them to their pre-admission baseline? If the chances are small, then consideration of their best interest does not carry enough weight to justify acting against the literal meaning of their tattoo. A little reading between the lines suggests that this combination of considerations is what persuaded the team at the University of Miami to honor their patient’s tattoo, just as it would have had the same directive been documented on paper. Of course, there are some advantages to the paper version, and it would be irresponsible for me not to mention them. First, unless I’m willing to tattoo a lot of skin, the paper version gives me the space I might use to elaborate on my preferences, not only about specific interventions, but more importantly about my goals, especially those outcomes I want to avoid. Second, since the tattoo probably won’t meet the requirements as to form set under state statutes, it is an advance directive that won’t offer the liability immunities such statutes provide. Not an ethical objection, I note, but a powerful motivator for risk management departments to be more skittish than they need to be in most circumstances, making it less likely that my wishes will be honored. Finally, a not inconsiderable factor favoring the paper version is the significantly lower risk of getting a nasty infection. Looks like a virtual tie on paper, but on balance, I’m not about to toss out my paper advance directive for a tattoo. If I see one as an ethics consultant, however, I will give it very serious consideration. Tom Tomlinson, PhD, is Director and Professor in the Center for Ethics and Humanities in the Life Sciences and Professor in the Department of Philosophy at Michigan State University. Join the discussion! Your comments and responses to this commentary are welcomed. The author will respond to all comments made by Tuesday, January 23, 2018. With your participation, we hope to create discussions rich with insights from diverse perspectives. This entry was posted in Bioethics in the News, Uncategorized and tagged advance directives, bioethics, Bioethics in the News, clinical ethics, DNR, do not resuscitate, tattoo, Tom Tomlinson. Bookmark the permalink. Since its really not possible to identify all the conflicting issues that might apply at the onset of a cardiac arrest, an ethical decision to start resuscitation would have been just as ethical amidst the story described in the NEJM Commentary. For many years, I was a member of a hospital’s medical staff that had a rule to ignore DNR orders during any surgical procedure requiring general anesthesia. It seemed that it was more of an anesthesiology issue. I suppose that if the medical power of attorney was allowed to attend the surgical procedure and was involved in signing the Consent form, that might be different. I always wondered if the patient with the DNR tattoo verified its meaning and was competent during the pre-0p conference with the surgeon to confirm it, what would happen at my hospital if a cardiac arrest occurred during surgery? The legal tradition might be especially an issue for the anesthesiologist, if the operating surgeon acting as “captain of the ship” ordered to NOT start any DNR. You’re right. The problem would be more acute had the patient needed to be rushed into surgery. As you note, it is common practice to suspend DNR orders for patients under general anesthesia. This is for two reasons. First, it’s highly likely that an arrest under general anesthesia is iatrogenic, caused by what has been done by the anesthesiologist or the surgeon. This creates a responsibility to correct the harm caused, unless there are strong countervailing considerations. The other reason is that since the patient is already intubated, etc., the cause of the arrest is more likely to be easily reversible. 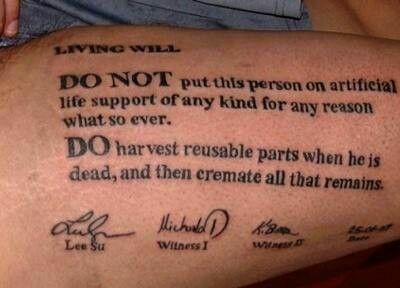 But these complications aren’t unique to DNR tattoos. They would arise for any patient with an advance directive containing a similar instruction.